Next let's look at manipulation as it relates to setting boundaries. Because of its connotations of changing others "by unethical means to serve one's own purposes," manipulation is a loaded word. In reality, manipulation also means skillful management, and as such, is a technique that you probably utilize constantly. The process itself is a legitimate one and only becomes questionable when it crosses the boundary of being used destructively. Because we use manipulation, we must face and assess it honestly. A therapist in a rehab setting may arrange a, quote, "chance" meeting between two amputees or two persons with the same illness. This ethical manipulating is acceptable when used as a tool to provide a constructive experience or to achieve a desirable goal. Also, we are ethically manipulating when we select a particular setting for a family conference. However, the evils of manipulation arise when we manipulate to achieve our personal ends, or when we manipulate without regard for our client's needs and rights to participate in the decision making process. 3. The distinction between those activities which are appropriate for the therapist to manipulate and those which are appropriate for the client to take charge, needs to be made on an objective basis. Here are some examples of ethical manipulation. When the activity calls for special knowledge and skill that the client does not possess, such as reading a chart, making a diagnosis, or searching out laws, participation by the therapist will be different. Thus, the therapist as the advocate of clients, works in the client's interest and, when possible, teaches the client to use these resources. Another obvious example of an ethical manipulation is crisis intervention. To define the problem and severity of the crisis event, I ask clarifying and direct questions about the current crisis. I then probe the client for as much specific information and details as he or she can tolerate in this state of crisis. This, of course, is important, because I can only assist with planning a safe course of action if I have a complete and accurate picture of the situation that triggered the problem. -- 1. What exactly happened? -- 2. When did it happen? -- 3. Tell me the first thing that happened that was upsetting...and so on. When is manipulating acceptable? 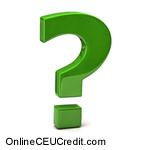 To select and enter your answer go to Ethics CEU Answer Booklet.